The area of land dedicated to organic farming in Europe has continued to grow steadily since the start of the decade, according to the latest data from the European Commission. But the dynamism of the organic sector has not been reflected in the wider agricultural field, with agricultural employment levels dropping despite rising overall. These are among the key findings from the so-called common agricultural policy (CAP) context indicators for 2014-2020, which have just been updated with the latest available figures from 2016. The figures show that the organic area increased by 30% between 2010 and 2016, reaching a total of almost 12 million hectares in 2016, an annual rate of 4.4%. The biggest increases came in Bulgaria, Croatia, France and Cyprus. The UK was the only country that registered a decrease (of 30%) during the same period. 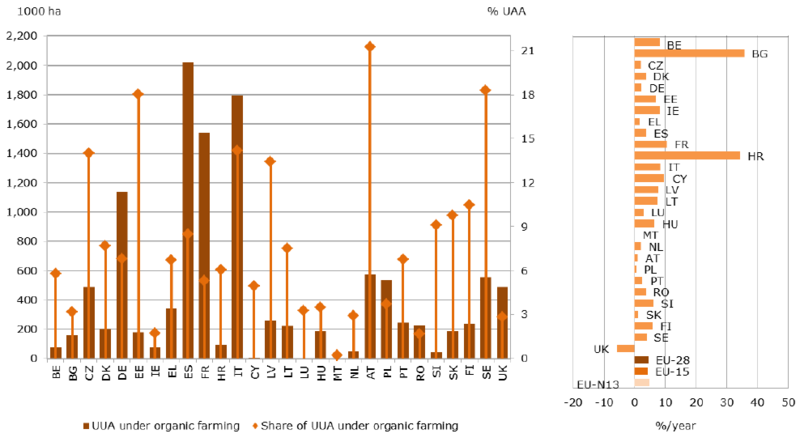 In total, the area under organic farming represented 6.7% of all agricultural land in Europe in 2016. The data also shows that the European economy is recovering from the 2008 crisis, with overall employment gradually increasing to 66.6% in 2016, compared to 65.6% in 2015. Trends are similar in all types of areas, including rural areas, towns and suburbs, and cities. However, employment in agriculture has slightly decreased in 2016 with a total of 8.9 million people employed in that sector compared to 9.2 million in 2015. This sector represents 3.9% of total employment in 2016, while it was at 4.2% of total employment in 2015. Out of the 28 member states, Romania, Greece and Poland have the highest share of agricultural employees out of total employment, with respectively 22.5%, 11.9% and 10% in 2016. 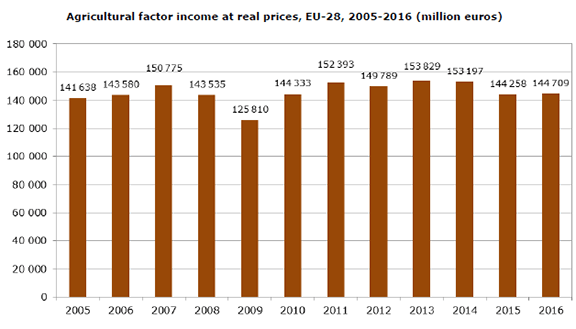 At the same time, agricultural income has started to decline again after recovering from the crisis and reaching a new peak in 2013. In terms of agricultural factor income – i.e. the remuneration of all factors of production (land, capital, labour), based on the value of production minus variable costs, depreciation and taxes on production, plus subsidies on production – incomes were €144,709m in 2016, a slight increase compared to 2015 but some 6% lower than 2013. More details and data for other indicators can be found in the recently published update of the CAP context indicators. These 45 indicators give an overview of general contextual trends in the economy, environment and society likely to have an influence on the implementation and performance of the policy. However, not every indicator has been updated because of a lack of available data for 2016.